Nancy Berk tackles life's crazy milestones with award-winning humor and a Ph.D. in clinical psychology. 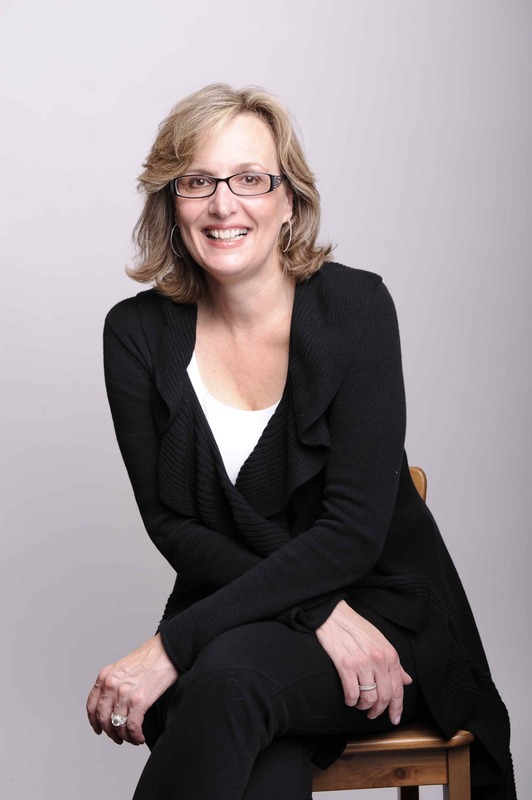 Author, speaker, columnist, and stand-up comic, this mom analyzes life so you don't have to. Friday nights can be stressful for parents of teens. Let’s face it, negotiating cars and curfews isn’t always easy. Throw in the “What about your homework?” question and you’ve got the recipe for a little bit of tension. If you have a high school junior taking the SAT tomorrow, tonight just might involve a little more nail biting. Check out my tips for The Huffington Post on how to keep your family calm. There’s strategy and fun ―and the opportunity to watch a Katy Perry video. College-bound families are rarely picture perfect. As teens prepare to separate and emphasize their independence, parents bite their tongues (sometimes), hold their breath (a lot! ), and try like crazy to keep their cool. 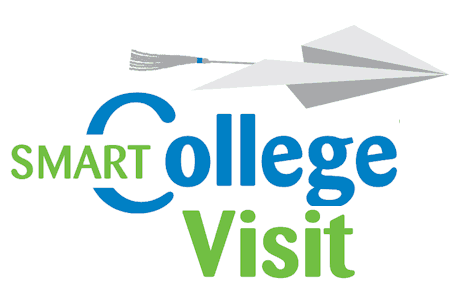 Check out this week’s College Mom Minute on SmartCollegeVisit.com for a few tips on weathering the count-down-to-college clashes. This month, as university logo decals get slapped on the back windows of SUVs everywhere, many high school seniors and their parents will move into the “Phew We’re/They’re in College” Phase. It’s an invigorating feeling, but important not to slip into autopilot. Some of the best laid college plans have been sabotaged by bad choices and poor judgement. Read the warnings I gave CollegeProwler.com here. They just might keep parents and teens on course as the countdown to college begins. College admission is a huge milestone on the road to career development. But if you think the next hurdle after passing freshman composition and surviving organic chemistry is a job search; think again! The identification and acquisition of internships is often an important component of the university experience and career portfolio. The student should drive the process, but families and friends can offer support and guidance. 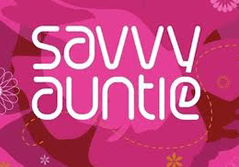 Read more about how aunts and uncles can help maximize the internship search and seizure here on SavvyAuntie.com. Guess what? Parents and teens don’t always see eye-to-eye on those college tours. That can be stressful for both parties, but there are plenty of strategies to keep tempers tamed and relationships in check. 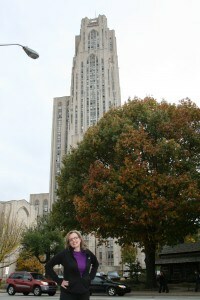 Last week I shared college tour tips for parents and students with Zinch.com. Hint: Get out of the car and leave the fanny pack at home. Read more here…. This week I had the opportunity to interview comedy legend David Brenner for my podcast Whine At 9. He was hilarious and charming, but what I hadn’t expected were the career lessons that surfaced during our chat. There’s a reason David Brenner’s career has been shining for decades. Read more about these success strategies in my Huffington Post blog. Yesterday, New Line Cinema announced that it had acquired the screen rights to Andrew Ferguson’s best selling book Crazy U: One Dad’s Crash Course In Getting His Kid Into College. Set to star as the crazed dad is Will Ferrell. Thanks to publishing deadlines for my book College Bound and Gagged, I was too swamped to read beyond the wonderful reviews of Ferguson’s book, but I am thrilled to see this great writer get a screen deal. What’s even more exciting is that Hollywood gets it. The stress and humor of college search and seizure is slowly becoming a recognized theme in film and television. From ABC’s The Middle to NBC’s Modern Family, parent-child conflict and higher education anxiety is front and center. Ironically, last month a friend asked me, “Who would play you in the film adaptation of your book?” After I finished laughing, I unsuccessfully struggled with an answer. Yesterday’s announcement made me think a little harder. And that’s when it hit me. It was difficult to come up with one actor to cover all of the phases I went through as a college-bound mom. Sure, Meryl could do it, but she’s still coming off of that recent Oscar sugar high. So, at the risk of going all Sybil on you, I came up with the perfect actors for each scene of my college-bound journey. SCENE 1: Stressed and Clueless Mom—Tina Fey à la Liz Lemon. She’s frazzled and clueless. Eventually she’ll get the bus where it needs to go, but the journey will be long and hilarious. SCENE 2: Do It Yourself Test Prep Mom—Martha Stewart. Okay, she’s not an actor, but her homemade flashcards would be the prettiest on the block. Shhh….I feel a line of dorm decorations coming on. SCENE 3: Essay Completion Drill Sergeant—Madonna. I know, her acting has been questionable, but have you seen those biceps? That woman is disciplined and no one has a better work ethic. She’s hired! SCENE 4: Embarrassing College Tour Mom: Kristen Wiig à la SNL. From her Target Lady accent to the one-upping Penelope, she could singlehandedly embarrass any child on the college visit. SCENE 5: Put Other Parents in Their Place Mom: Julia Roberta à la Erin Brockovich. Some of those bragging parents need to be verbally slapped down off the bleachers. Julia’s got the chops to stand up for the underdog in her “Big Mistake—HUGE” Pretty Woman way. SCENE 6: Voice of Reason Mom: Meryl Streep à la It’s Complicated and Mama Mia! I know I’m back to Meryl again, but she’s my favorite and we have the same hair. Plus it’s my book. Authors are allowed to dream you know. This month isn’t just about basketball. That’s because at least 3 million families are scrambling to coordinate college visits and/or facilitate college admissions’ decisions for college-bound teens. From road trips to trip tix, parents are scrambling to get on the path to higher ed. This month, I covered the March Madness of college visits for GalTime.com. Read more here…. 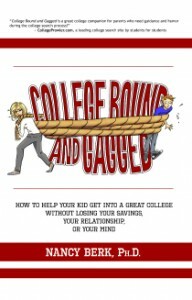 The Amazon reviews have been wonderful for College Bound and Gagged. This week, Jennifer Wagner of ConnectWithYourTeens.net weighed in on the book and we couldn’t be more thrilled. Read more here and learn about teens, technology, and parenting from a mom who has the answers. Remember the old days, when kids applied to college and parents sat in the background without interfering? I don’t think my parents even proofread my essays. Times have changed a lot since then. Now college is a family affair and everyone’s weighing in on the process and being weighted down by associated anxiety, confusion, and costs. And you don’t have to be a parent of a college-bound teen to feel the panic or the excitement. Aunts and uncles are important players in this milestone journey. 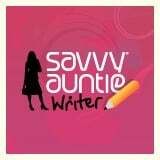 This week I’m thrilled to be a featured SavvyAuntie.com guest writer, sharing my tips with aunts (and uncles) everywhere on how to help their college-bound families stay grounded. Read more here….